Tweens look best in natural makeup. There are plenty of tween makeup options that will suit the style of any young girl experimenting with cosmetics for the first time. Tweens are generally defined as boys or girls who are "in between" their childhood and teenage years. A tween is between the ages of 8-12 years old. Right around this time, some girls naturally become interested in tween makeup. Helping your tween find a cosmetic palette that is complimentary and age appropriate can add a boost of self esteem and pride to their confidence levels. When's a good time to venture into the world of makeup? Parents will know when their child is ready to experiment with cosmetics. A peaked interest in beauty and bath products will suddenly take a turn, and one day you'll find yourself answering the question, "When can I wear makeup?" Rest assured there are hundreds of cosmetics that are age appropriate and fun for a pre-teen girl to experiment with. 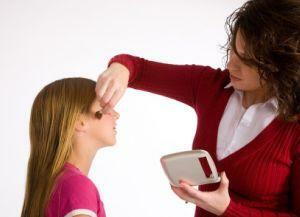 Tween makeup need not be expensive or complicated to look good and flatter. At this age, tweens are pretty easy to shop for, usually opting for glitter or fruit scented lotions and cosmetics, but that doesn't mean a tween can't experiment with a sophisticated brand for a unique beauty look. Before you start cosmetic shopping for tween makeup, set some boundaries of what's acceptable for your tween to wear, and set a reasonable budget. And then, make a day trip and shop cosmetic counters or the beauty aisle to help your tween find cosmetics that fit the bill. Everyone has a few facial features that are worth emphasizing. Whether that be big lips, big eyes or long eyelashes, figure out what your tween's best features are and make them a focal point. By emphasizing just a few select facial features, their makeup won't be heavy or overdone, yet will flatter and become their image. Eyes: For big and beautiful eyes, shop for a highlighting eyeshadow in a shimmery neutral sand or bisque shade. This versatile color is basic, inoffensive, and highlights big eyes beautifully. Lips: Tweens with voluptuous lips can get away with a slick coat of a neutral lipstick or a high shine gloss. Eyebrows: Many tweens have thick and full eyebrows. To draw attention to this unique asset, have eyebrows professionally waxed or groomed and maintain their shape with a colored eyebrow powder and gel. Blush: Emphasize high or defined cheekbones with a sweep of blush. Lip and cheek stains add a natural sweep of color that is youthful and feminine, and provides all day wear. If you're on a quest to find affordable tween cosmetics, look no further than drugstore brands such as Jane, Bonne Belle and N.Y.C. For those seeking a mid price line, consider Clinque or Prescriptives cosmetics, both of which can be found at major department stores. Sephora is yet another cosmetic store chain that offers brands such as Benefit, Urban Decay and Stila, which are all well suited for the natural and fresh faced palette appropriate for tween makeup. Tweens learning to apply makeup for the first time may benefit from a trip to the department store cosmetic counter, where a sales associate will help instruct them how to apply cosmetics. A gift certificate to their favorite cosmetic store makes a great gift for a young girl entering her tween years. Certain cosmetic products should be avoided at this age due to their application difficulty. Liquid eyeliners, liquid foundation and lip liner are better suited for teenagers that have had a few years behind them applying and experimenting with makeup consistency and application. Although watching a young girl enter her pre-teen years can be a bittersweet time period for parents, experimenting with tween makeup is a rite of passage that will help transition her into her formidable years with confidence.